Donors are the volunteers who donate their haematopoietic stem cells to any patient in the world who needs a transplant. At WMDA, a group of medical experts actively monitors the safety of donors and provides guidelines for organisations worldwide. Donor recruitment, including education, managing expectations and informed consent: it is important to give a potential donor accurate information at recruitment so that he or she is aware about the registration and donation process, and the potential consequences for the recipient if the donor chooses to withdraw at any time. 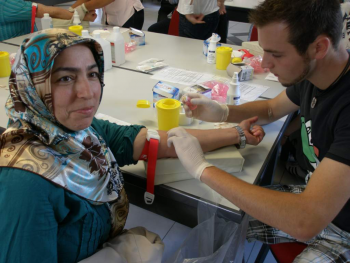 Use of mobilising agents: WMDA carefully monitors the use of mobilising agents stimulating the normal blood growth in donors. In 2015, the Medical Working Group published a recommendation, which was updated in 2017. Click here to read the most recent recommendation for the WMDA members in relation to the use of mobilising agents. Donor health assessment and eligibility: the WMDA has established a donor medical suitability tool, which donor centres and registries may use to consult and request a consensus opinion on whether a donor is suitable to donate or not. All WMDA guidance is intended to complement, not supersede, guidance from national authorities and international regulatory bodies. Confidentiality: the anonymity of the donor is assured during the search and donation process. However, after donation, 35% of organisations, that provide haematopoietic stem cells, allow direct donor-recipient meetings after a predefined time period has lapsed. Donor as research subject: a donor is considered as a research subject if there is interaction with the donor for research purposes, or if the donor’s identifiable data will be included in the research; WMDA recommends establishing procedures to ensure such requests are handled efficiently. Donor follow up: WMDA encourages internal data collection on donor complications both during and following donation. A donor follow-up is recommended 30 days after collection, and then one year, five years and 10 years after donation. WMDA has template forms available for performing donor follow up. Find here the information on Hematopoietic Progenitor Cells Donor Follow-Up from ARTHIQS. Subsequent donations: in 5–10% of donations, a subsequent donation may be requested; it is important to inform donors of this possibility before their first donation. Read more about WMDA recommendations on subsequent donations here.